I went a little Cuttlebug crazy tonight! 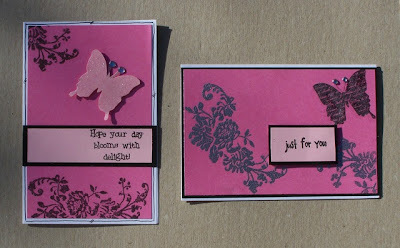 I created a card for COPYCAT CARDS, using my Cuttlebug & then decided to continue the theme for a whole range of cards. The style I used on them all is the same but I really like the first one SO I kept on going & made three! I hope you like! 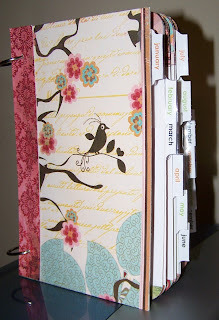 WEEK 4 CHALLENGE IS...Tall/Skinny OR Short/Wide - That's right step out of your comfort zone and make a DL sized card. Pretty simple- so why not join in yourself. you might even win a prize!!!!!! 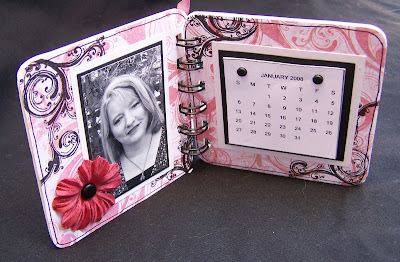 I was inspired over the weekend by a very talented local scrap friend,Michelle, to create a couple of these itty bitty mini calendars. 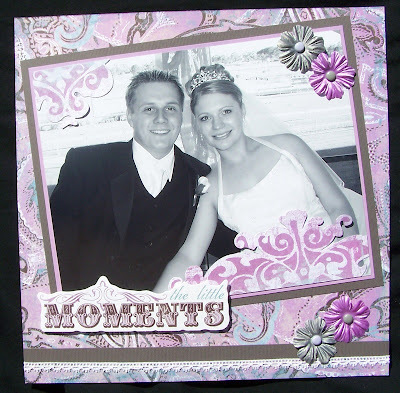 They are made out of coasters & I used the ever so yummy Basic Grey Two Scoops patterned papers. I had to use my ever so trusty Bind It All as well to bind them together. Firstly- If you haven't entered my RAK please go back 2 posts & do so. You have until the 14th of Feb to enter & its really easy to do so!!!!!!! Happy Australia Day long weekend to my Australian Buddies. To everyone else I just simply hope you are having a happy weekend! I have had a wowser of a weekend so far! The creative juices (LOL) are still flowing ....SO I am going with it! 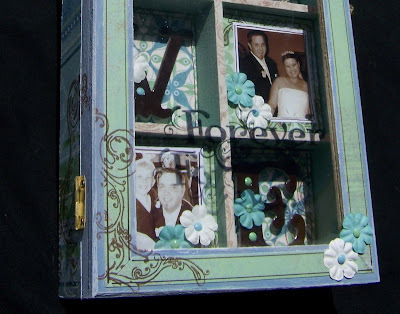 So far I have created a shadow box (I will share a sneak for you) Using the yummiest of papers. The new Basic Grey 2 Scoops. It is just lovely to work with. Yesterday I headed off to Harvey Norman to process some photos & was ever sooo excited to learn that as a promotion for Australia Day they were processing 8x10 inch photo's for 26cents. I could not believe it. I LOVE huge photos. I was allowed 10, SO you guessed it thats what I got,10! Last night I was ever so inspired to use the new enlargements & the ever so delicious Bohemia, (Bliss Darling Daughter) Patterned papers & embellies that I picked up from SCRAPSIDAISY. The photos are HUGE & the papers are amazingly beautiful SO I didn't really have to do much! I have a couple of other projects in mind for tonight. So check back real soon! I have had a wonderful weekend & I hope you all have had the same. I used the lovely Urban Lily patt. papers & lots of stamps & doodling. 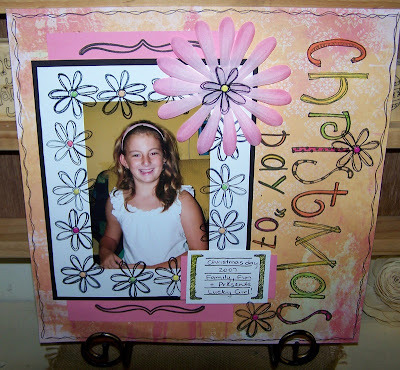 Be sure to keep your eye on the Scrapsidaisy newsletter to find out when the class for this will be held. The next thing I created was a pre-purchased Aussie scrap kit. It is a great idea to leave your family members with lots of treasured memories & deep thoughts. It is called "A Year In Question" & was heaps of fun to create. The kit is all pre-packaged & has all the lovely Basic Gray Blush papers that you need to create it in it. Another one to watch the timetable for. Pretty yummy looking huh! 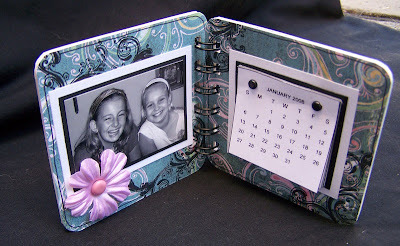 they were sitting on my scrap table while I was creating this page & I used all the yummy colours as my inspiration. That's about it for tonight. I have done a few other things but I will save them for mid-week. Thanks for stopping by & make sure you leave a comment on my last post to go into the draw for the RAK that I am giving away on FEB 14th. I have finally decided what I would like to give away..........yeah!!!!!!!! For those of you that don't know I am really, really lucky enough to work at my LSS- SCRAPSIDAISY, in Wingham, N.S.W. So... when I was at work the other day I remembered the RAK that I have been promising to give away for a while now & took 5 minutes to look. I finally decided on a set of clear cling stamps with an acrylic block. The set is not a smally! The stamps measure 140 x 180mm & the block is 102 x 58mm. So it is a great size!!!!!!!! !AND BRAND SPANKIN NEW!! So whats the catch you ask????? well nothing really! all you have to do is leave a comment on this post & I will enter you in the draw. I will get one of my kiddies to draw it randomly (from the hat so to speak) on VALENTINES DAY. February 14, 2008. BUT if you would like a second chance in the draw simply subscribe to the Email Subscriptions in my sidebar & I will enter your name twice in the draw. So here is a picture of the stamps that some lucky duck is going to win! Be sure to leave a comment so that you go into the draw. GOOD LUCK!! & THANK YOU to all the lovelies that have for the past 12 months have left comments & became my blogging friends. I treasure everyone of those comments & really enjoy the whole blogging world! I hope everyone is having a safe & enjoyable beginning to the New Year! I have that is for sure! Yesterday I had the pleasure of spending the day with a dozen or so very enthusiastic cardmakers! 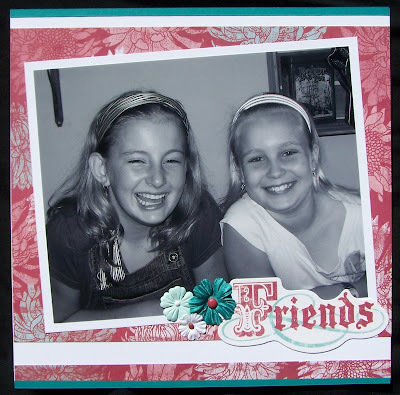 It sure is fun to see people, that have never created a card before, create something that they really LOVE!!! We had 4 classes during the day. It was such a fun Day too. I think I already mentioned that! I will share with you a couple of the projects that we created on the day. The cards above are all unique fold cards. 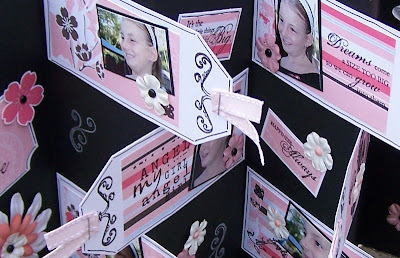 It was great to make cards that were something a little more fancy then the normal folds. I had 2 other classes on the day. One was an off the page wooden hanging & the other was a scrap page. 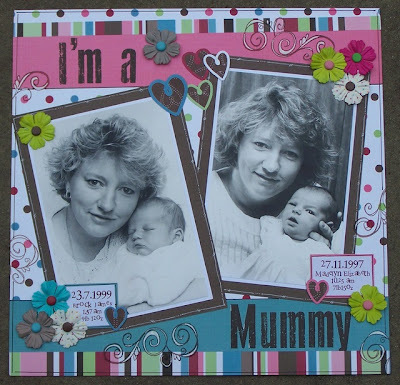 We still have a few kits left at SCRAPSIDAISY (instore) if you are interested. 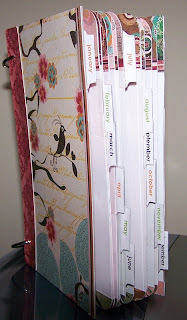 They come with full instructions & all the goodies you need to create the projects. While I am at it if you are one of our local ladies be sure to mark Saturday the 9th of February in your diary as that is when we will be doing it all again! 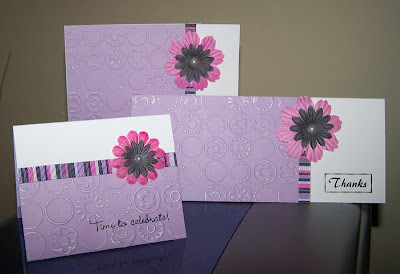 I am pumped at the moment & have spent all weekend creating the projects for the next cardmaking day! There will be some really different cards next time!!! Thanks to all the lovelies that have visited my blog & left really encouraging comments. I appreciate every single one of them! I hope that everyone has had a safe & wonderful New Year & I look forward to another joyful year ahead admiring your inspiring creations. I have been doing a bit of creating over the weekend.I have created a few classes for next weeks cardmaking day(but I won't share!) & then I dug out some older photos. The first photos that I created with are both of my kiddies (newspaper) birth photos. So I created a layout with them both on the same page. The next page I used another photo that is also a couple of years old. 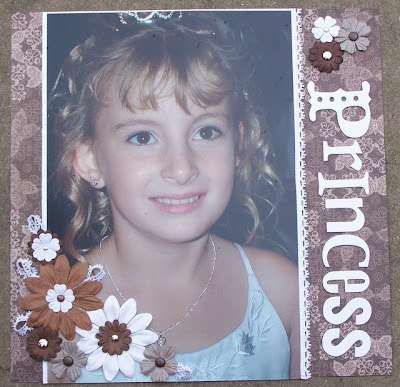 It is a 8x12 photo of my D.D when she was a flower girl for my niece's wedding back in 2005. 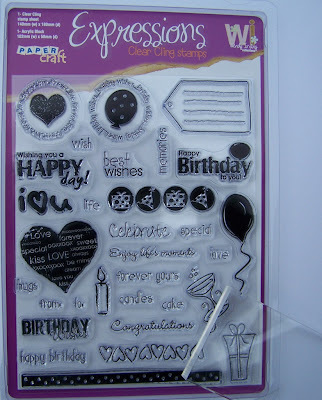 I am JUST loving the new Chatterbox range of papers atm. Be sure to check back in the next week or so Because I am sorting out atm what I will be doing for the RAK that I promised last year.